The Race To 10,000 & Why GWS Is Amazing. GWS is genius. Seriously. I know that I always say that they should hire me (which they should) but there are certainly clubs in the AFL that need me more (Brisbane, North, Melbourne, and especially Port for instance) because GWS is blowing my mind with their marketing techniques. Shall I demonstrate. At the beginning, they had Israel Folau. Regardless of what you have to say about Folau’s ability you have to admit that he was a big draw for GWS. I’ve done two posts (here and here) that discuss his value to the team and I think that now, looking back, we can say that although he wasn’t a tremendous player he was certainly a great marketing technique. We don’t know how many people attended games just to see Folau play but the jersey sales speak for themselves (72% of jerseys sold were number 4 – Folau’s number). But we’ve talked about this before – so why am I writing again? Because Kevin Sheedy threw down the gauntlet, that’s why. On Twitter, he issued a challenge to the Gold Coast Suns, Bluey McKenna in particular, for who could reach 10,000 members first. They responded in kind and the terms of the bet are that the loser walks on the beach (a busy beach, I’m guessing) in a budgie smuggler with the other team’s logo/colours. THIS IS GENIUS. First off, this is the perfect rivalry. I know that some people want there to be a Sydney rivalry between GWS and the Swans, but this is certainly not the time for that. The Swans are premiers and GWS are too green (ha ha, green giants, I crack me up) for this rivalry to work just yet. But GWS and GC? It’s perfect. They’re both new teams with young guys and legends for coaches. Secondly, the fans can really get involved. If GWS milks this (which they should) then it provides a perfect opportunity for fans to get involved with their team. Even though I live 2 hours out of Sydney, I am THISCLOSE to buying a membership to help GWS make this happen (although, I must admit, it would be AMAZING to see Sheeds in a Gold Coast budgie smugler – decisions, decisions). I can promise I’m not the only person who feels that way. And finally, GWS benefits. This is a win-win situation. If GWS beats Gold Coast, then they get 10,000 members. Obviously a good thing. And if they lose, then Kevin Sheedy will show Australia, yet again, how awesome he is. No one would think less of him for rocking that teeny bikini – they’d think he was awesome. Not only does GWS benefit, but Gold Coast and the AFL benefit (sorry, I guess there was one more thing!). Gold Coast gets the same advantages (more members or the chance to be called ‘mad’ by the Australian population) and the AFL has financial perks. They likely won’t have to pump money into the expansion teams, plus they get more exposure (without having to do anything) and involvement in Queensland – which is one of their “problem areas.” Good work, Sheeds – you’ve done a good thing all around! GWS – your marketing rocks my world. This may not have been intentional, but everyone is going to get some serious exposure for this. Just make sure the AFL puts it on it’s home page. The Swans Are Smart And Kurt Tippett Is… Not. Free agency and I… we have a complicated relationship. Maybe I’ll tell you about it someday. The economist in me knows that it’s the right thing to do and it must be allowed but the sports fan in me closes its eyes, grits its teeth and waits for all the trades to be over. But this thing with Kurt Tippett just made me roll my eyes, especially considering how it’s pretty much shaping the rest of the trades. The way I see it, Sydney could be getting a great deal and Tippett could be making a big mistake. The Sydney Swans are smart to grab him up. For starters (and one of the most important aspects when obtaining players in a trade) is that he’s the perfect age to make some big contributions. Depending on the sport, professional athletes tend to hit their stride between 23 – 26 and have a good few years after that. An added benefit is that they haven’t spent the past six years training him. It’s expensive to train players – and usually, if you get him at the right price, it’s cheaper to trade for him once someone else has done the hard yards. If I were a coach, I would only draft 19 year olds and trade for 25 year olds. It’s genius. Tippett is also a great compliment to the current forward half – they’re all young, but they’re on the right side of 26. I can see that being one of the strongest offenses in the league come 2014 (personally, I think they’re just a bit too young to dominate next year and if we’re honest, Hawthorne has the best offense right now). If those guys learn to play together, and play well, there’s no reason why Sydney shouldn’t be looking at another premiership in the near future. And not only is he a decent forward, he can play the ruck. This is important since all the Swans current ruckmen are getting up there in age and, I believe, aren’t that great (sorry Shane Mumford, I’m just not your biggest fan). They’re good, sure, but Tippett could be better. And have I mentioned that they’re likely getting him dirt cheap? Yea. Adelaide might as well give him away. 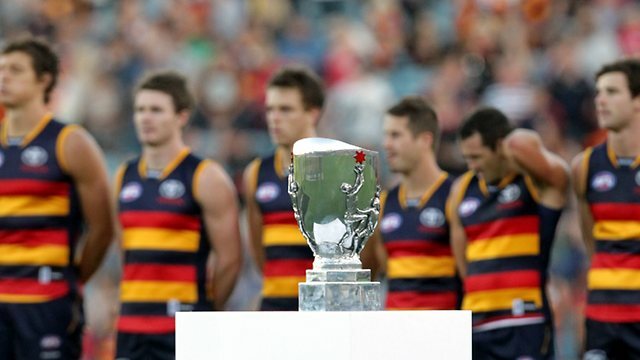 The first thing that my boyfriend said when he heard about Tippett wanting to leave Adelaide was ‘Adelaide is getting good – why would he leave now?’ My reaction was, ‘Sydney just won the premiership – he’s already missed the boat.’ Let me explain. I know that it’s blasphemous to say your team isn’t going to win, especially after a great win in a great game against a great team, but look at it this way: since the massive changes to the AFL in the 80s, only four teams have won the premiership twice in a row (one team won three years in a row, but I’m calling that a freak accident). I think it’s safe to say that players go to teams where they think they’ll win a premiership. Isn’t that every pro athlete’s goal? And odds are stacked against Sydney to win next year – he would have been better off staying with Adelaide. Adelaide also okay’ed the trade because he told them he wanted to go home to Queensland. He made a deal with them so that Adelaide would accept whatever they were given (essentially) so Tippett could go play at home. That’s a pretty nice thing to do considering how valuable he is. Now that he’s shirking his half of the bargain, Adelaide has changed their mind about what they’re willing to take for him. And they should… but it might damage their relationship with the Swans and that would be a sad day. Adelaide could also get screwed in this whole agreement because if no deal is made… Tippett can just run away to another club leaving Adelaide with no compensation. Tippet gets whatever he wants in either case. It all seems shady to me. I don’t really respect players who request trades. He’s also not a free agent. I don’t know… just seems rude, to me. Have some loyalty, man. And doing it because you claim homesickness? YOU ARE A GROWN MAN. Oh, and I’m not a big supporter of breaking up via text. Seriously, Kurt? That’s just cruel.